Protact® laminated steel is food-safe and optimised for efficient, sustainable canmaking with opportunities for differentiated brand performance. It is a proven material solution across a number of high-performance canmaking applications and formats. Protact laminated steel from Tata Steel meets market needs for more sustainable, reliable and safe packaging material. Infinitely recyclable, Protact is food-safe and optimised for efficient canmaking. It is a proven material solution across a number of high-performance canmaking applications and formats including DRD cans and D&I aerosols. Efficient canmaking Protact removes the need for up to five cost-intensive operations associated with the use of lacquers – eliminating VOC emissions and cutting water and energy consumption. Its extra width allows a 10-15% increase in canmaking output. High wall ironing ratios deliver consistently reliable forming. Optimised performance Protact is suitable for all product applications. It comprises a steel substrate with a three-layer polymer coating system on each side. 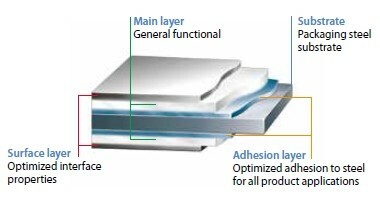 Each layer is optimised for can performance and processing benefits. The coating can be tailored to your needs for maximised efficiency and brand impact.